Treliver Farm Project, during 2013 I had the opportunity to visit Treliver Minerals. My friend had done some work for them and had arranged a meeting at their offices. Much of the information on here has been supplied by Mark Thompson of Treliver Minerals. I must thank Mark and his team for taking me around the property. Also for the permission to publish the images on my website. 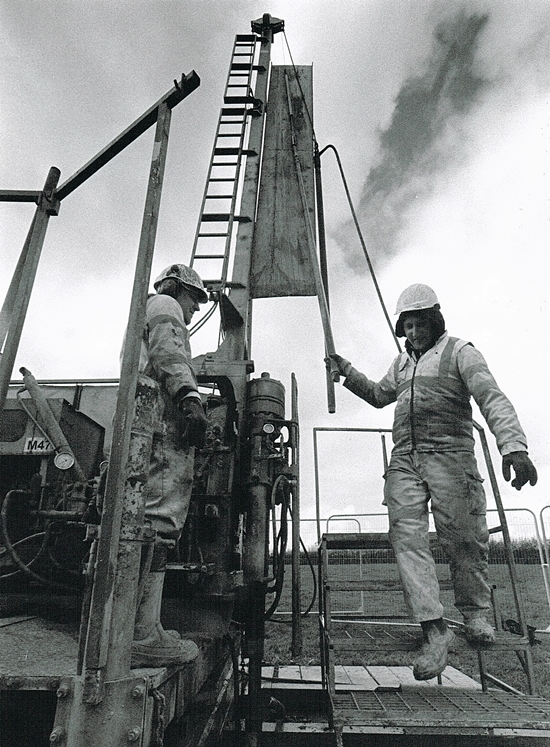 Treliver Farm was initially discovered by Billiton Exploration (UK) Ltd in 1982 following a regional stream sediment and soil sampling survey. 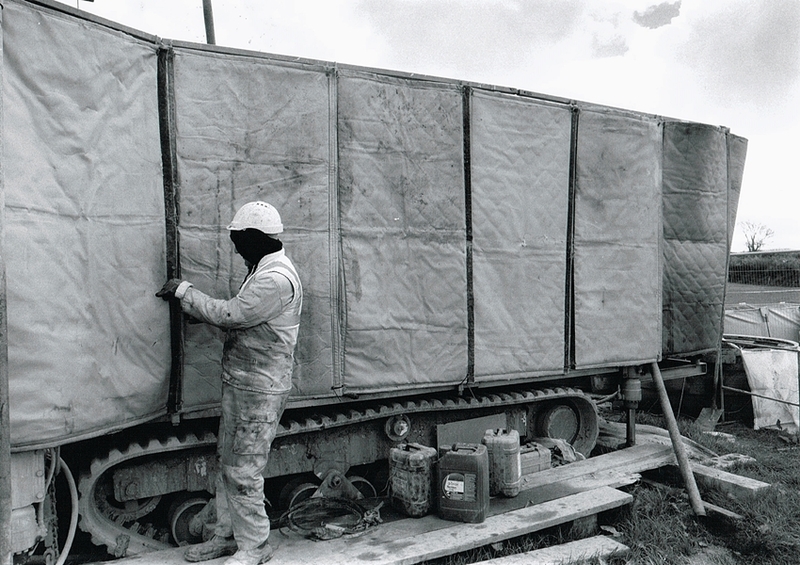 The company partially drilled the property but walked away from Tin exploration after a calamitous drop in tin prices in 1985. Treliver Farm Project 1: This is close to the drill site. Evidence of old workings had been found in the area. 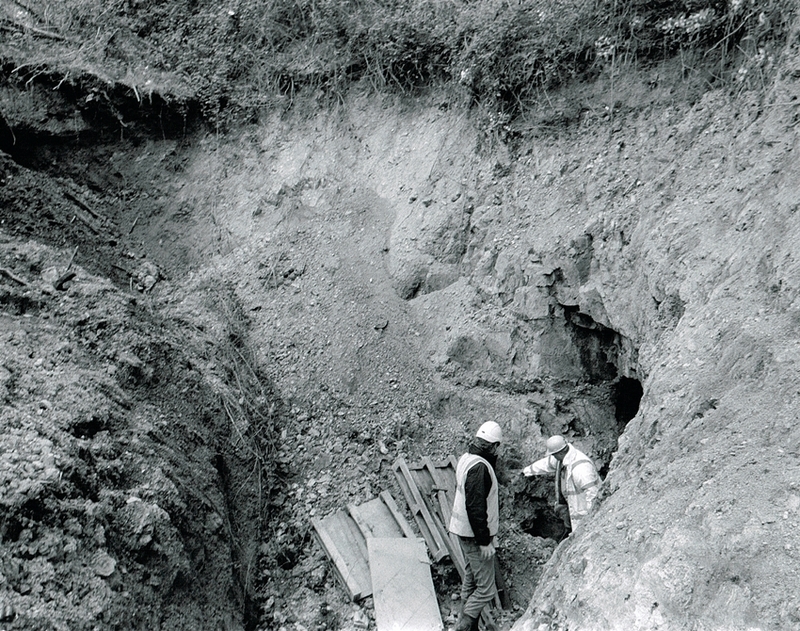 This pit had been recently excavated intercepting some ancient workings. 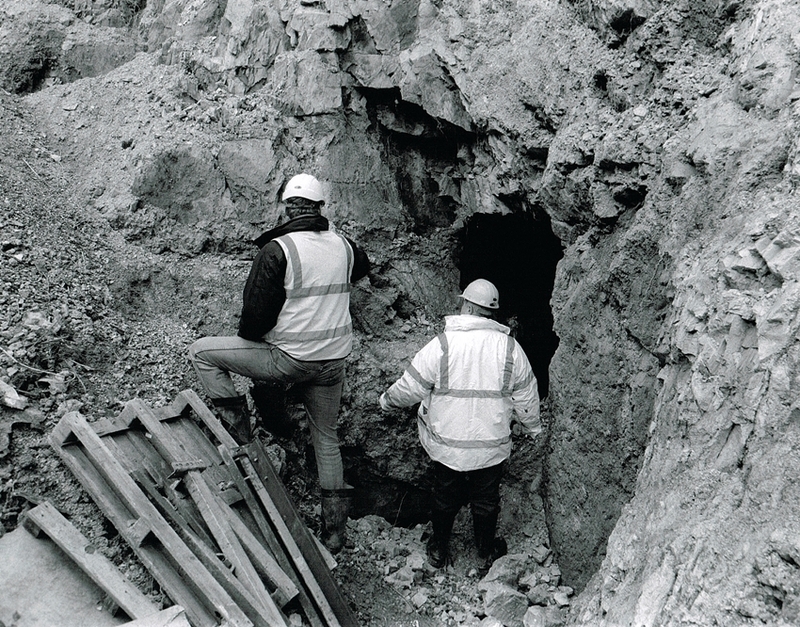 Mark Thompson is in the entrance and on the right is Alex King, company Geologist. 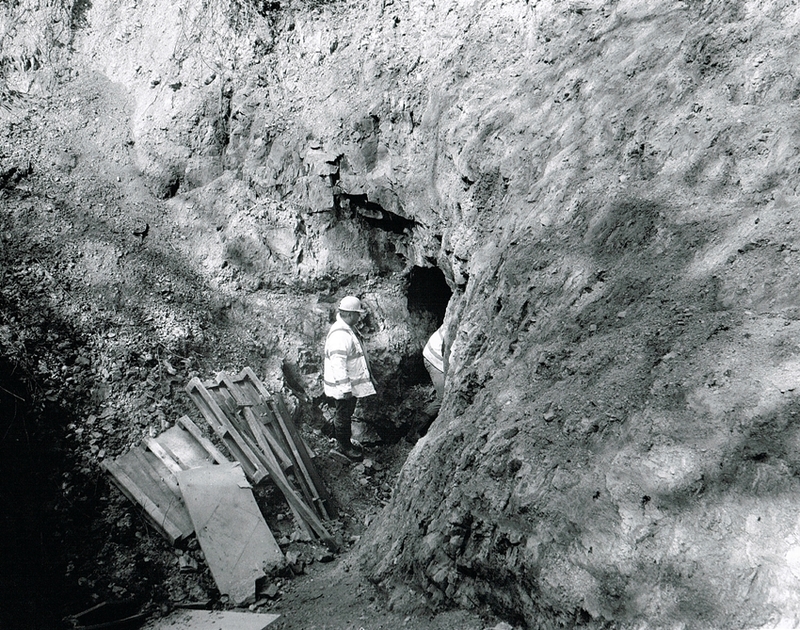 Treliver Farm Project 2: A small tunnel had been found. Samples from within had shown strings of Tin assaying at an amazing 10%. Treliver Farm Project 3: A closer image of the old workings. Sadly the concentrations here did not warrant further investigation. 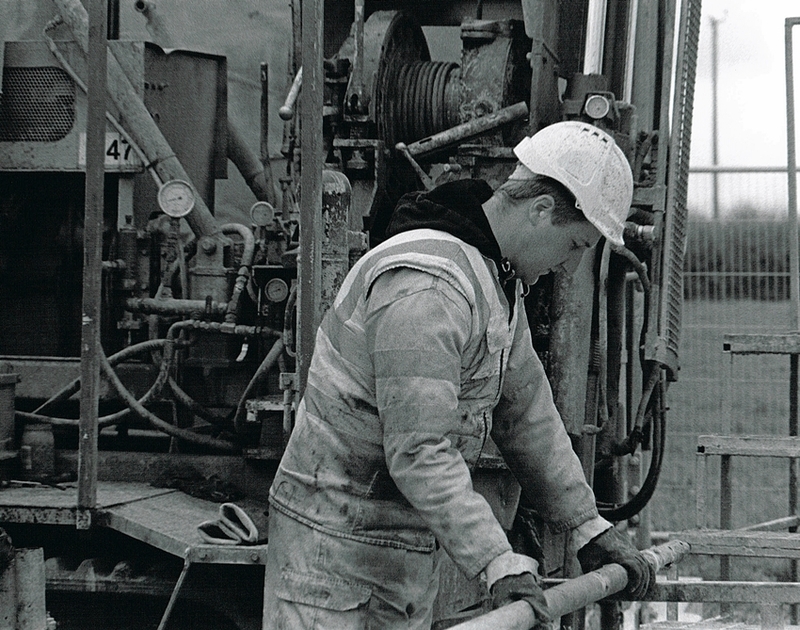 Treliver Minerals has drilled 6,000m in 58 holes along 700m of strike. 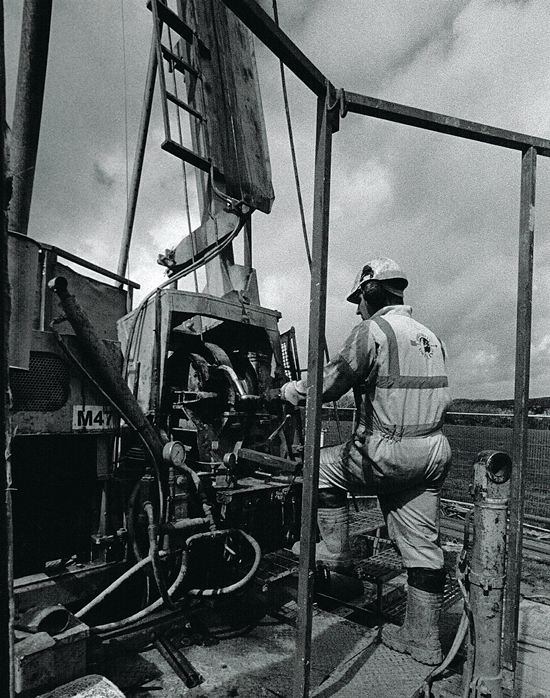 A resource of 4.5 Mt at an estimated grade of 0.15% was identified. At depth there was the potential for much more. 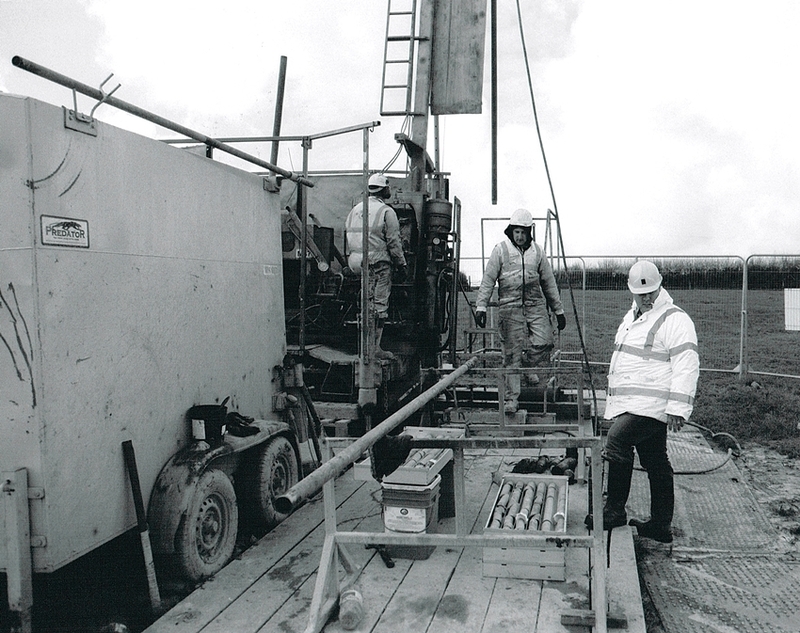 Treliver Farm Project 4: The first view I had of the Drilling Rig. It was not a good day for photography. Cold and miserable the sun hardly showed at all. Also, it was blooming cold. 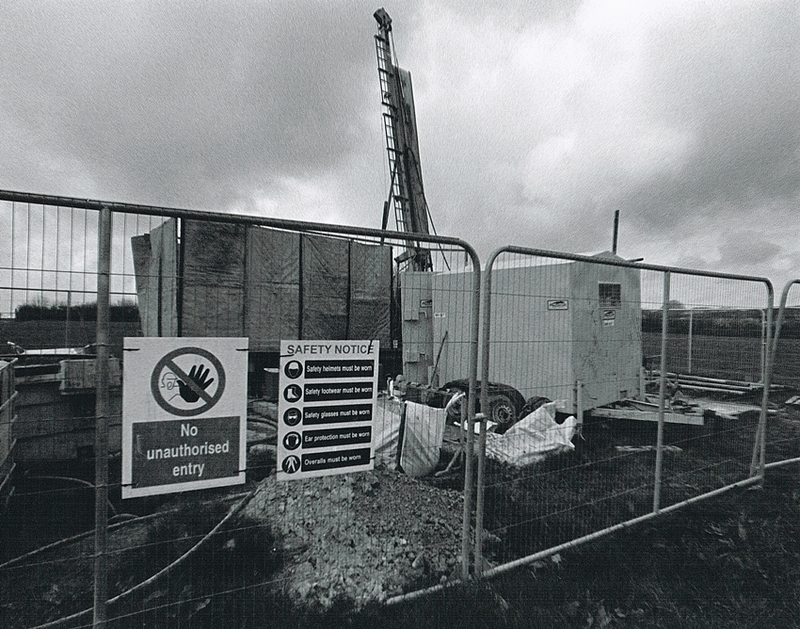 Treliver Farm Project 5: As this was an active drilling site, health and safety regulations had to be followed. Treliver Farm Project 6: The drill enclosure from the opposite side. 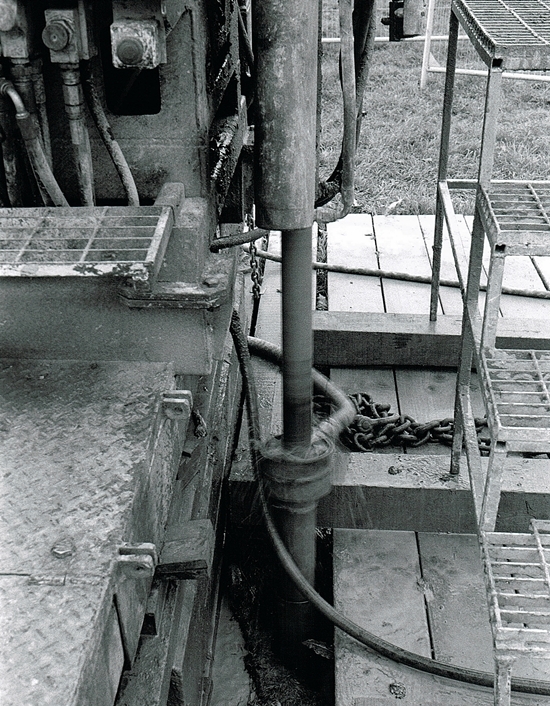 Treliver Farm Project 7: Mounted on caterpillar traps meant the drill rig could get almost anywhere. 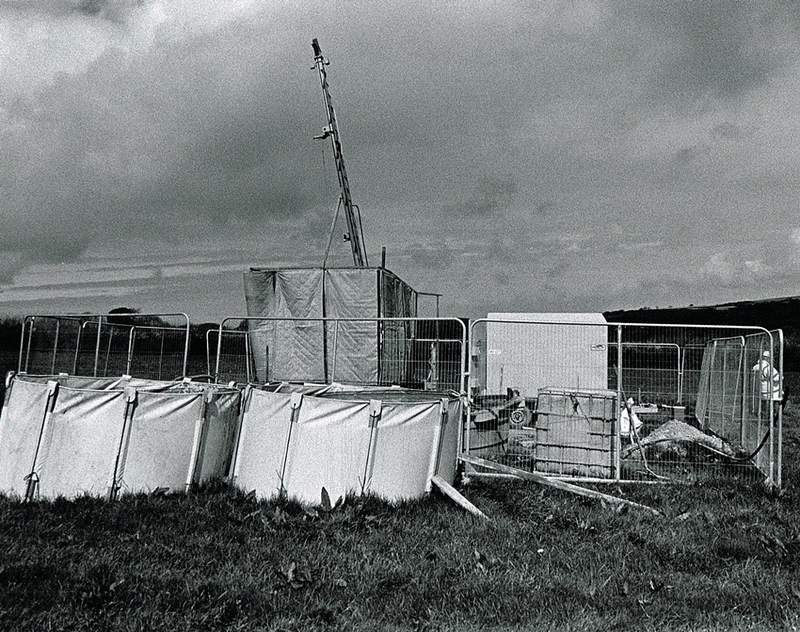 Even to the middle of a boggy field in Cornwall. Treliver Farm Project 8: So, this is what it was all about. 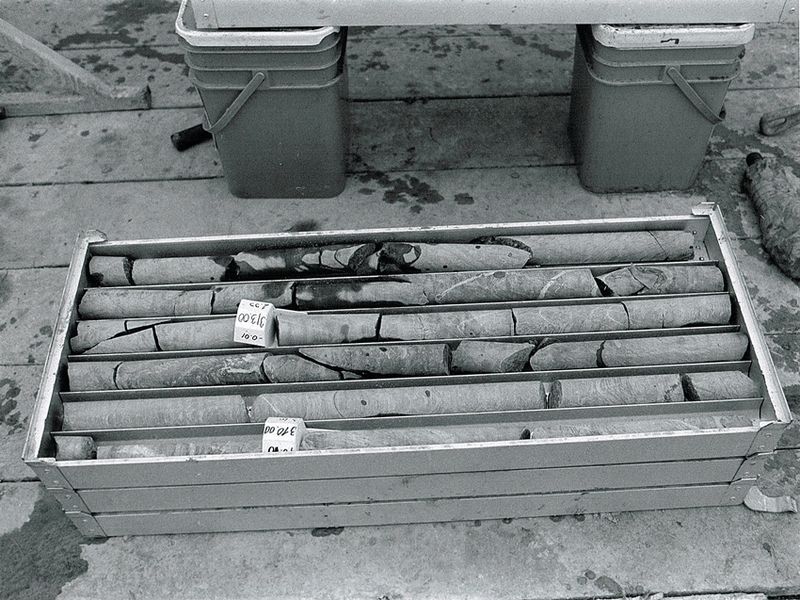 These are the recovered cores from the drilling operation. Once assayed they would give a broad indication of the resources deep underground. 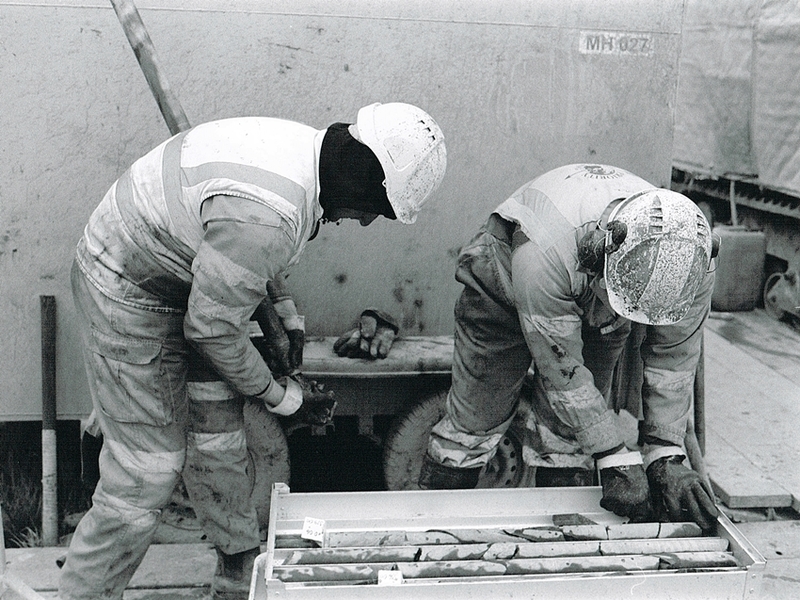 Treliver Farm Project 9: The main purpose of the days visit was to see the cores recovered from the latest hole. 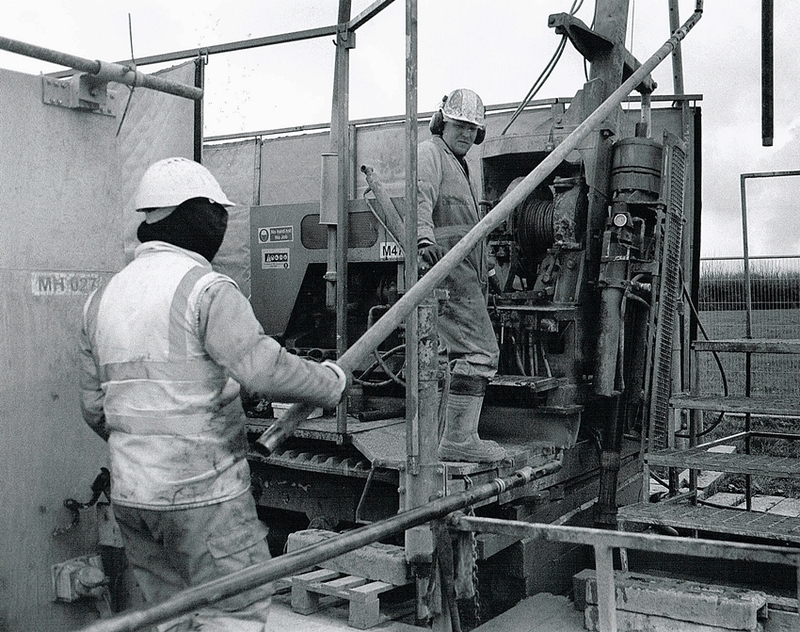 Here the operators are removing the hollow rod which contained the drilled material. 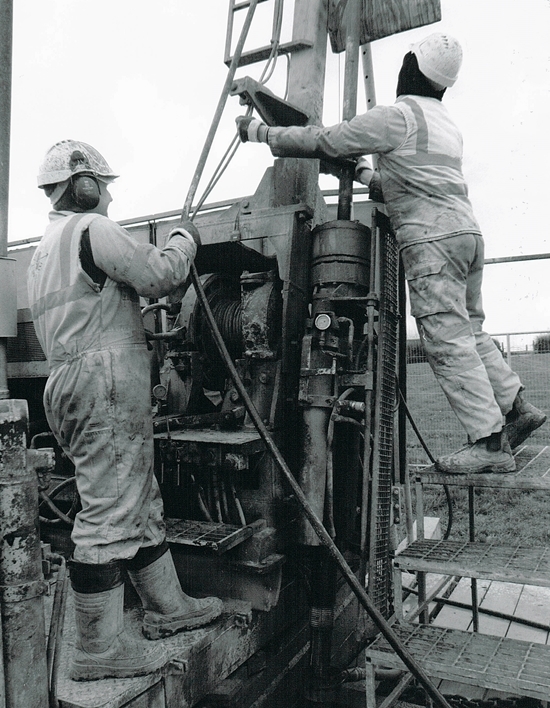 Treliver Farm Project 10: Here the drill rod is being opened to remove the cores inside. Treliver Farm Project 11: Finally the screw has been loosened enough. 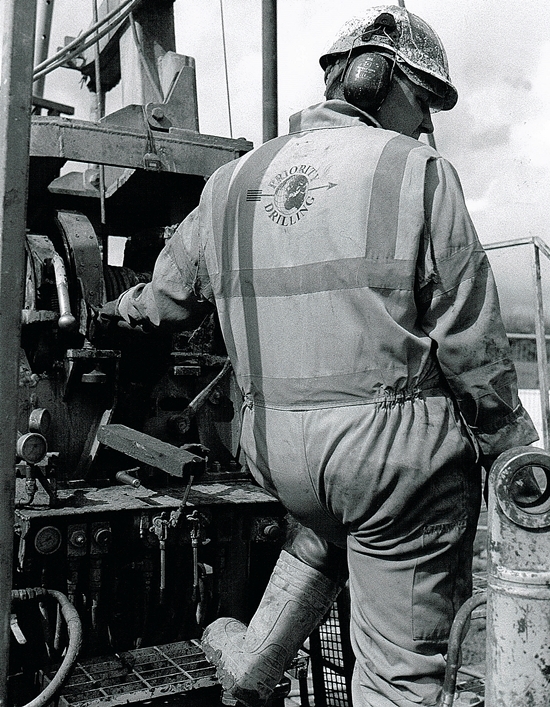 Treliver Farm Project 12: A good image of the drill operator laying out the hollow drill tubes. 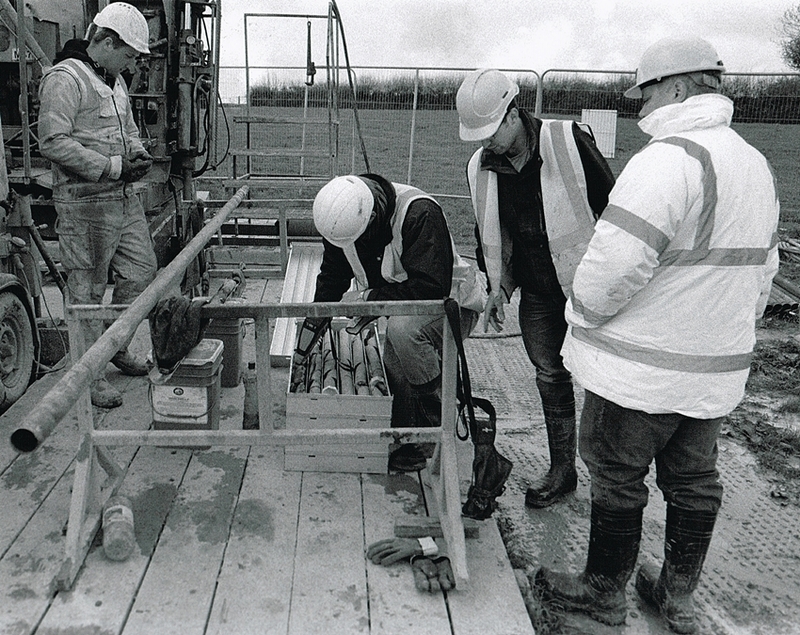 Treliver Farm Project 13: Applying grease in an effort to unscrew a particularly stubborn drill tube. 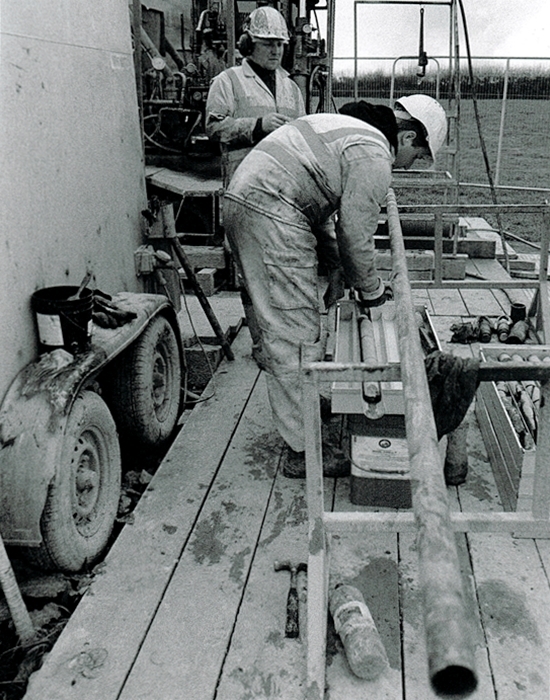 Treliver Farm Project 14: The hollow tubes are laid out prior to having the cores removed. 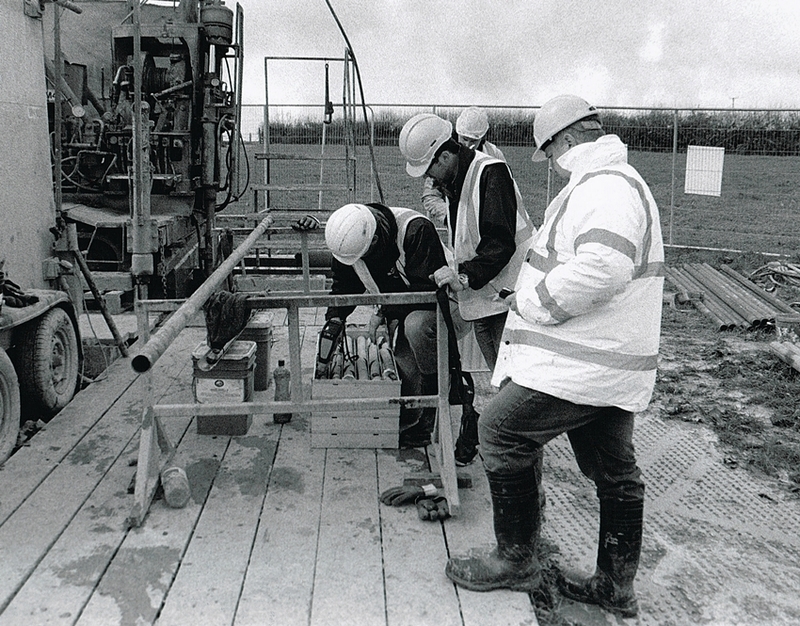 Treliver Farm Project 15: When the drill tubes have been opened. The fragmented cores are laid into the boxes. 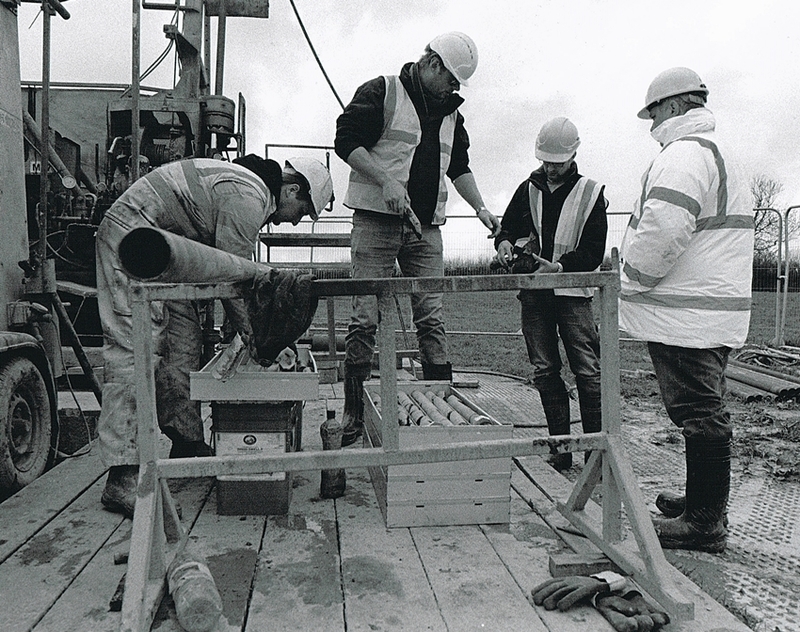 Treliver Farm Project 16: In this image the remaining cores are being shaken from the hollow tube. Treliver Farm Project 17: Mark Thompson looking at the newly released cores. This is not a cheap undertaking, the results from here needed to be good. Treliver Farm Project 18: Treliver Minerals Geologist Alex King was eager to examine the cores. Treliver Farm Project 19: Both Mark Thompson and Alex King know this was an important time for the company. 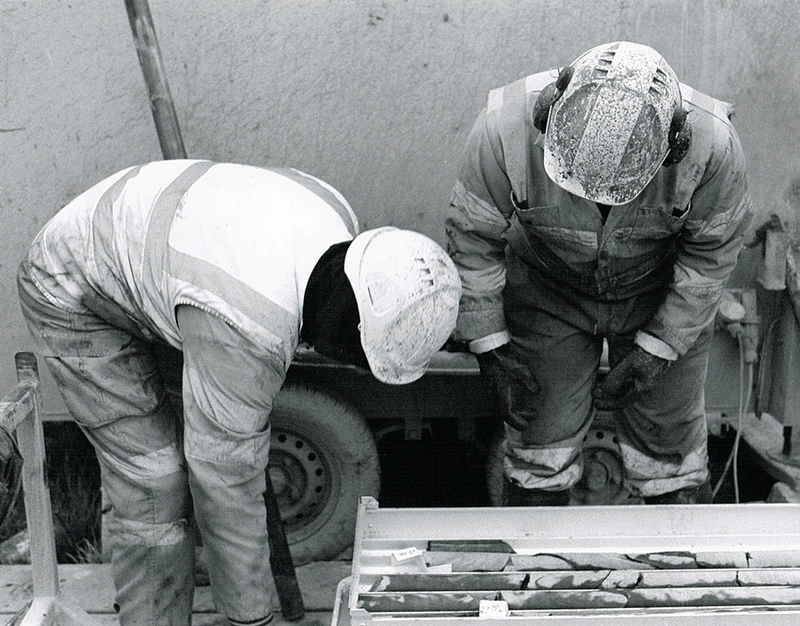 Treliver Minerals Project 20: At last another employee arrives with a portable rock analyser. 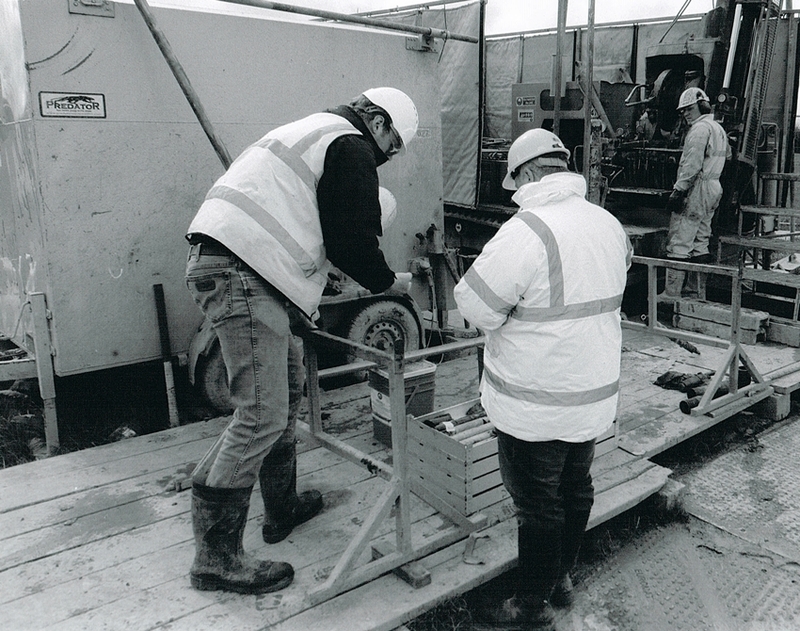 Treliver Minerals Project 21: The examination of the core material can at last be started. Treliver Minerals Project 22: Alex King is using the portable analyser to initially check the Tin content. This is only an approximate indication. In time the cores will be properly assayed. 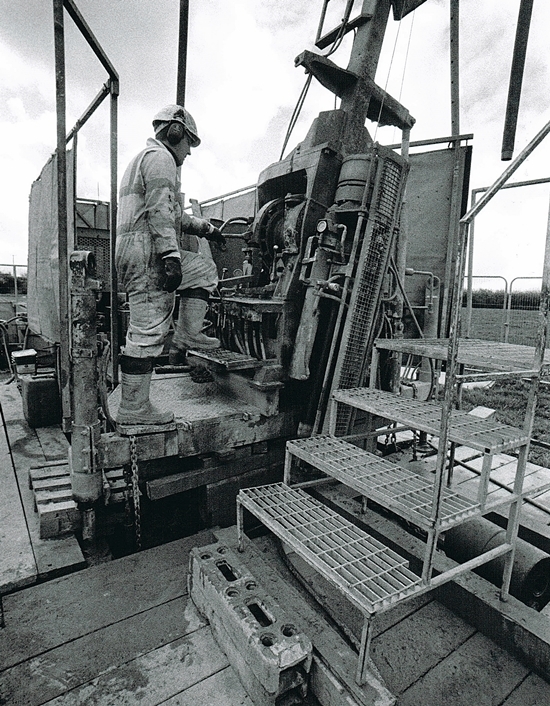 Treliver Minerals Project 23: This is the drivers platform of the drilling rig. 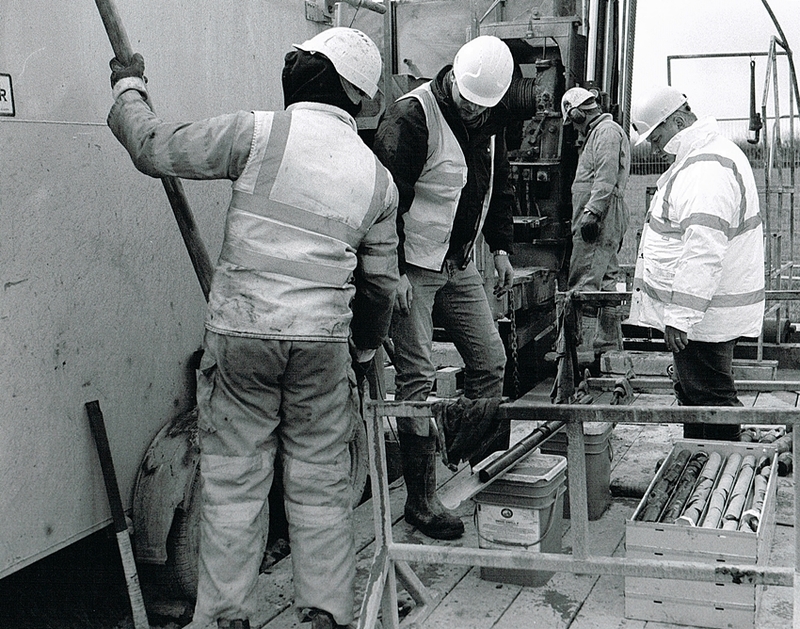 Treliver Minerals Project 24: A slightly wider image of the drivers platform. 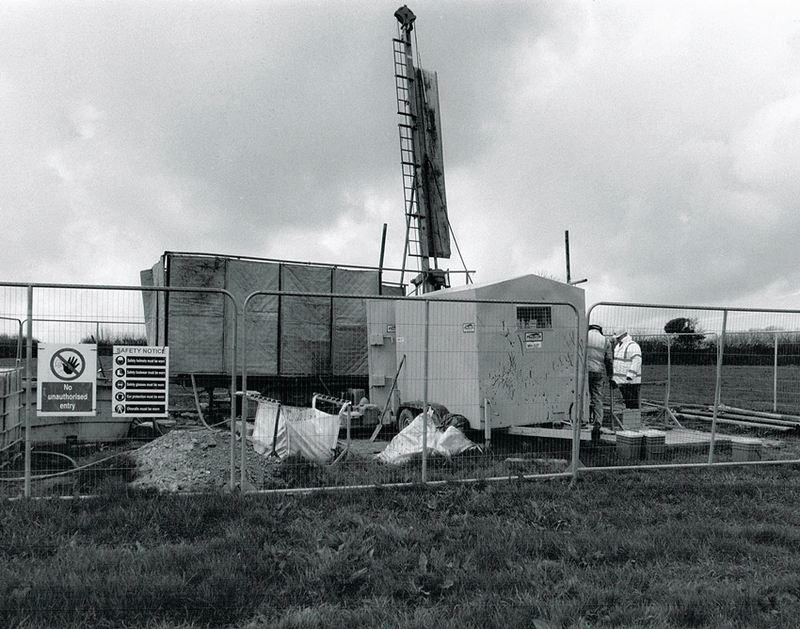 Treliver Minerals Project 25: The cables running up the drill mast got tangled due to the windy conditions. 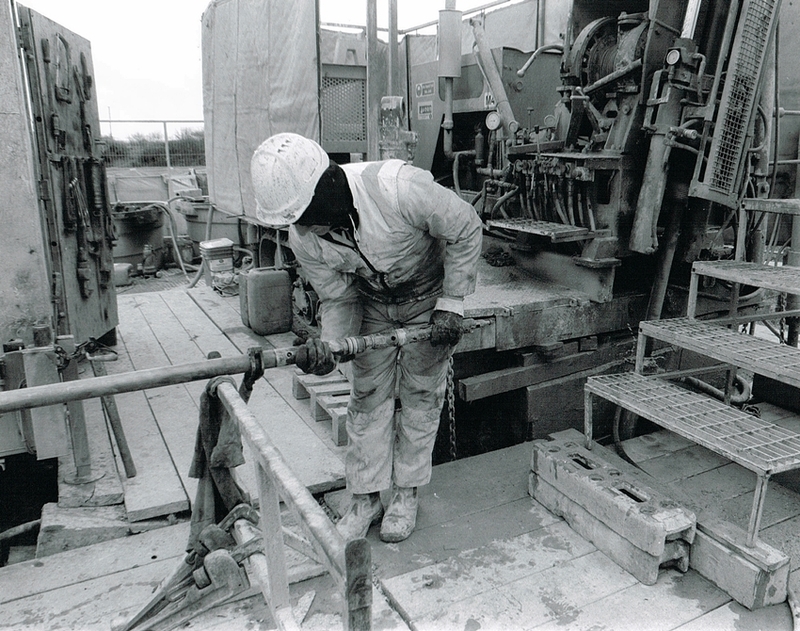 Treliver Minerals Project 26: The complicated drivers position of the drill rig. 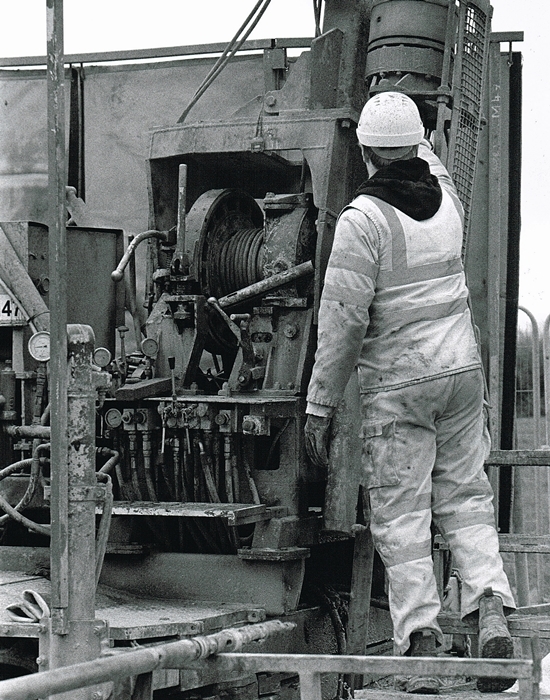 Treliver Minerals Project 27: A closer image of the drill operator. 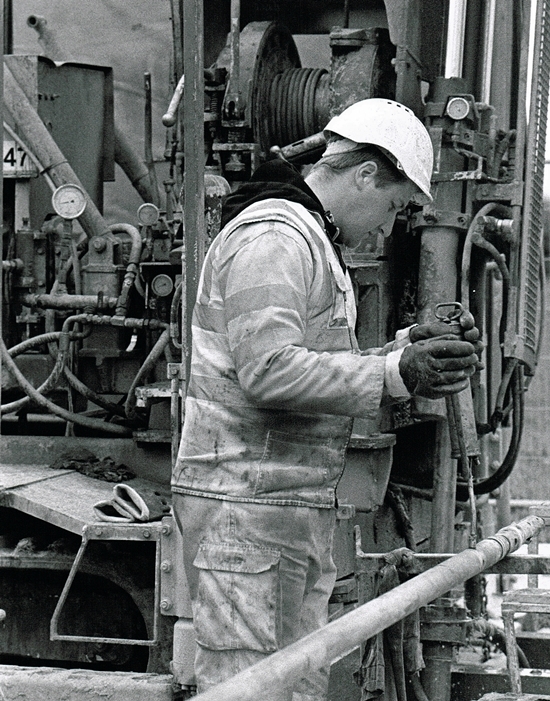 His overalls display the name of the drilling company. 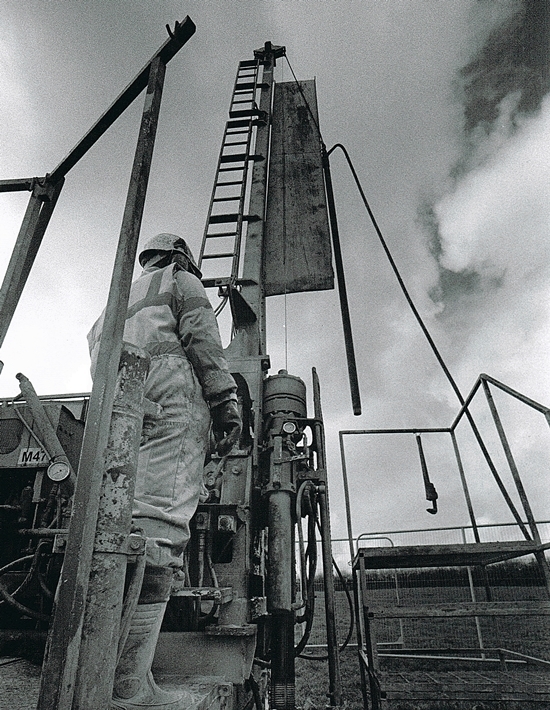 Treliver Minerals Project 28: This photograph was taken using a very wide angle lens. Because of the low viewpoint the mast of the drill rig looks huge. Treliver Minerals Project 29: Whenever possible and trying not to be in the way I grabbed as many action shots as I could. Treliver Minerals Project 30: For a few brief minutes the sun decided to show itself. Consequently I was running around like a mad person to grab as many pictures as possible. 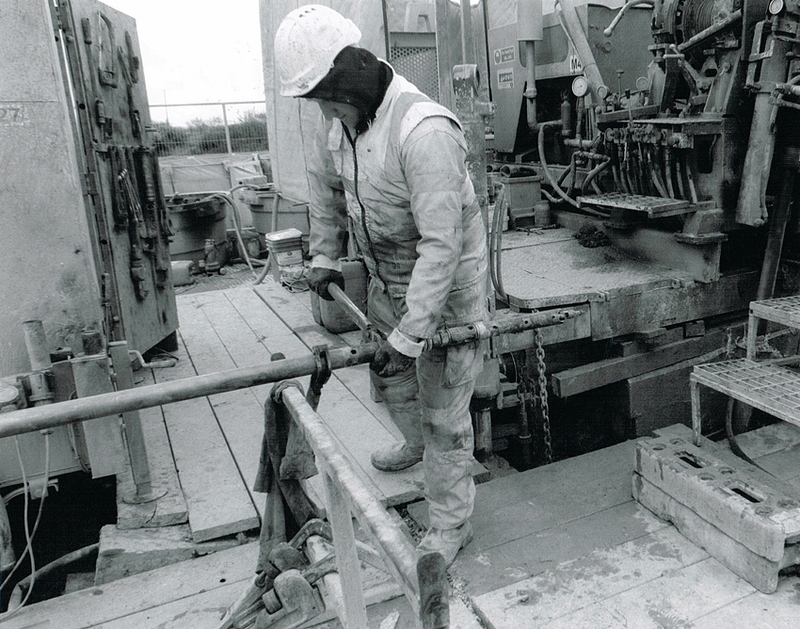 This is one of my favourites of the drill operator. 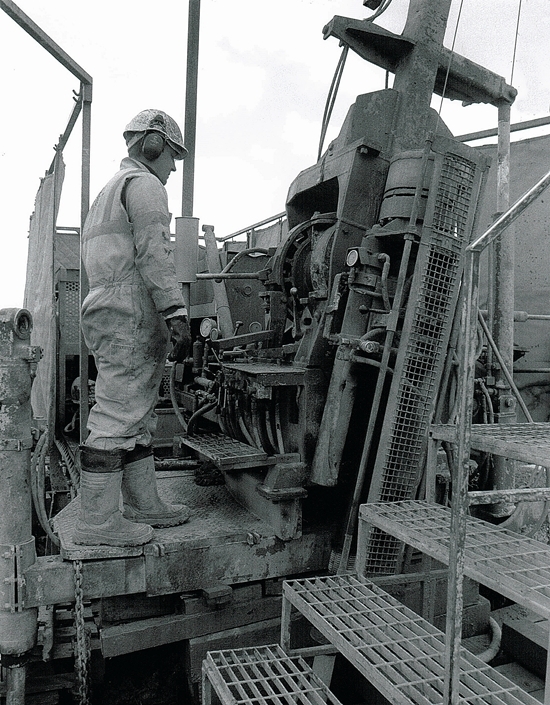 Treliver Minerals Project 31: This is the rotating drill. Deep underground the core is being collected. Sadly the resource on the project was not enough to move forward. Perhaps in time the Tin price may rise again as other deposits become worked out. In that event the area may become a viable proposition.